A very generous parent donated this cute playhouse to our class. The playhouse stayed in the closet for a few days while we decided where and when to set it up. On the big day it hit me to assemble it inside out! This is the story, all about how my life got flipped, turned inside out! It was a little tricky at first. The instructions were clear enough but turning the folds in the opposite directions didn’t always make sense. I persisted and had it assembled in under an hour. The big reveal! The children had a great time decorating this cute house. Hopefully it will hold up and we can use it again in the spring. The outer (now inside) is printed with butterflies and flowers. I saved the box so we can stash it for the long winter. We wish all of our readers Happy Winter Holidays, whatever, however, wherever you celebrate. Lots of these winter holidays include some type of gift giving traditions. The concept of giving is important for children to learn and practice! We started with a few small empty gift boxes, squares of wrapping paper, and transparent tape at the table. We worked with small groups and helped when needed. The teachers talked with the children about who they wanted to give a gift to. We discussed that these were pretend gifts and had no toy inside. 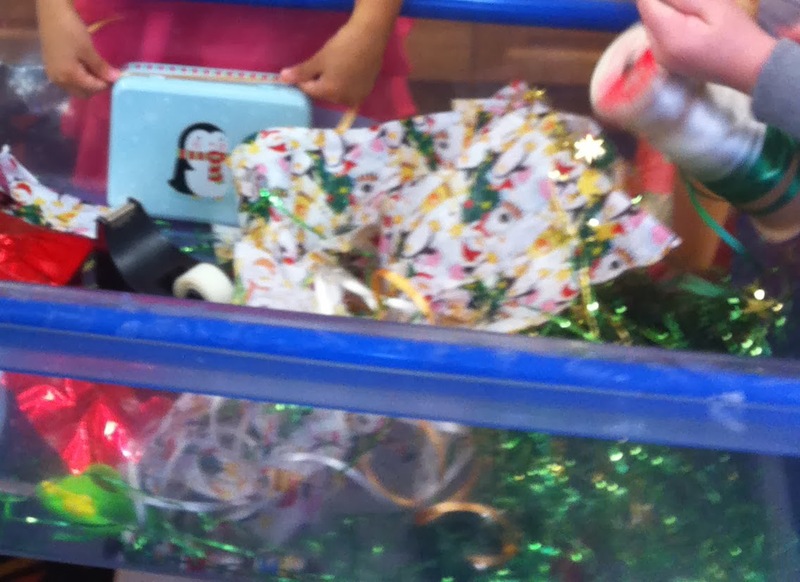 Each child enjoyed giving and receiving the “gifts”. The next day we put all the wrapping supplies in the sensory table. The children had the skills to work almost completely independently though some still had difficulty with the tape. This was great fun for all. We hope your children can can learn the art of gift giving too! Gingerbread dough mix. Just add water!Run! Run! As fast as you can! Kids can decorate & re-decorate trees if you offer mini trees and safe ornaments. More than one is a must!